Come home to true luxury. Create your backyard haven from just $29/a week. Wondering which hot tub will be perfect for you? Simply answer a few questions about your needs and preferences, and you’ll instantly see your best Sundance Spas options! Ready to create your dream retreat? Aqua-Tech can help! When you want to install a hot tub and take full advantage of your personal paradise, we’ll be with you every step of the way, from finding you an exceptional tub at the most affordable price to our skilled in-house team installing it quickly and efficiently. You’ll find your perfect model—regardless of budget, taste or space—within our range of premium Sundance Spas. 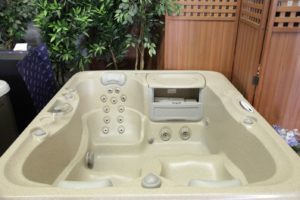 You’ll be able to rely on our knowledgable team of Sundance Spa experts to help you choose your perfect hot tub, tailor it to your needs and lifestyle, install it, fill it, and show you how to operate it. And, with a Sundance Spa you’ll also be covered with a generous warranty you won’t find anywhere else. When you purchase from Aqua-Tech, you’re not just getting a hot tub – you’re getting a full-service team of professionals who will help you ensure your spa stays in peak working order for as long as you have it. We look forward to welcoming you to our showroom and helping you find your new Sundance Spa! We love our hot tub. Every season brings a different type of enjoyment and there is nothing like a soak under the stars after a hard day's work. — Byron & Janis R.
Try a Sundance Spa from Aqua-Tech Hot Tub risk free for 60 days with our full refund guarantee. Reduce strain on your tired and achy muscles with a hydrotherapy massage in your own back yard.